We use a variety of software to create, edit, and render these architectural images. 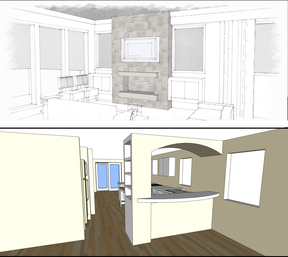 We create renderings based on your dimensions, which can be anything to hand-drawn sketches to detailed CAD drawings. You may present us with fully detailed ideas, or we can experiment with options together. Prices vary greatly depending of the level of detail and specificity you require, square footage of space, and complexity of design. This makes creating a price list tricky, but here's some basic guildelines so you can see that renderings are an affordable tool for everyone. Making a mistake on paper is much cheaper than making a mistake in real life. This design service is designed for the homeowner or small builder. 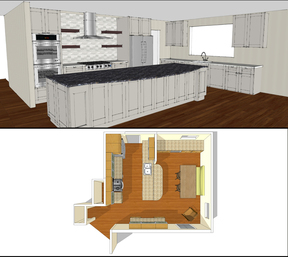 We use basic 3D modeling to help visualize possible floorplans and layouts. Basic block shapes with simple shading help you envision big possibilities. A starter plan for $299 gets you a consultation on site, at least 3 basic space options developed from your dimensions, and a final meeting where we sit down together and pull all the best elements into a final plan. As you move toward a decision, extra time can be added to craft details and apply materials to your space. You'll get the picture. Making a mistake on paper is much cheaper than making a mistake in real life. These models are appropriate for the design professional who is looking for a quick, cost-effective image for a client. These images great a visual language to communicate your ideas to the client. Cost depends on size, complexity, amount of cabinetry involved, and how exact materials, furnishings, etc need to be. Good tool for Design Development and client approval. A basic residential space starts at $175. This level of model creates a "Wow" factor to your clients and potential buyers. Special attention is paid to light, materials, and final touches to create a warm, inviting space. 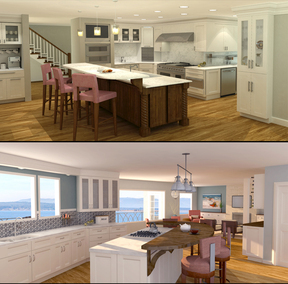 These fully rendered images are rich with detail to pursuade your audience that this is a home they want to live in. Cost varies depending on size of area, complexity of room , and how exact materials and furnishings, cabinetry, lighting, etc need to be. Kitchens tend to be more expensive due to the details involved. Pricing for most spaces between $299 and $400.